I chose to do the Inca Trail to Machu Picchu for months; we had really wanted to make the trek. Everything was very nice, what I liked most of the trek was the food they cooked the cooks are geniuses, we ate delicious things every day, we were all happy. the trek we did was great, everything went better than I thought, starting the briefing in Cusco office was very motivating and very informative. the recommendations of the guide helped us a lot because we carry only what is necessary and not have to carry a lot. The reward of walking the Inca Trail is the breathtaking experience of viewing Machu Picchu at sunrise as you complete the last of the trail leading you to the ruins. It´s truly a magical place and a meaningful life experience – I couldn´t recommend it more. The Inca Trail hike is hands down one of the most rewarding adventures that I have ever experienced. Doing this trek through Inca Trail reservations made the whole journey all the better, for they truly are the best hiking companions an individual could ask for. 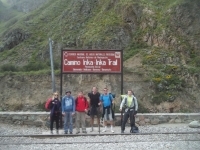 Overall the experience trekking the Inca Trail was an amazing experience. Our guide was Carlos. He was informative and helpful throughout the trek. He always made sure to check up on us, made sure we fully understood the Incan significance of the ruins as well. He was humorous and really made us feel like a family. 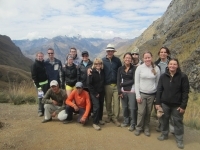 The Inca Trail hike was fantastic, and I would highly recommend Inca Trail Reservations to my family and friends. My husband and I took a 10 day tour and loved every moment of our trip! 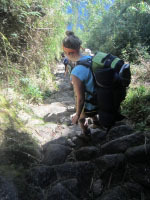 Inca Trail Reservations was extremely easy to work with through every step. The staff was friendly and accommodating to our needs. We really enjoyed our tour through the Sacred Valley and the sites we saw were amazing. A short but wonderful trip! I was in Peru June 2013 and took part in the 4 day hike of the Inca trail to Macchu picchu. After doing research myself and two friends decided on using Inca Trail Reservations. 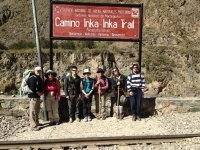 The Inca trail hike was a huge success and I would recommend Inca Trail Reservations to my friends and family. We began with an orientation the day before our trek began and Victor, our guide, went through everything we should bring and expect. We left Cusco at 5:30am and baggage our hike at 9:30 the same day.